BBI products reflect the strength and ingenuity of the people who use them. Junior and Scott Whitworth, a father-and-son duo out of Worthington, Missouri, exemplify this fact of life in their multiple pursuits within the world of agriculture. In years past, the Whitworths raced in the high-stakes World of Outlaws sprint car circuit and have since moved on to the less physical and more cerebral world of competitive tractor pulling. Sprint car racing utilizes high-powered cars on short, oval tracks, making for a heart-thumping, adrenaline-pumping sport. “It’s a real rush – it’s hard to explain,” said Scott Whitworth. “You never take your foot off the accelerator. It’s such a demanding sport that you even have to re-train yourself how to breathe during a competition – and at an average of 140 miles per hour on a 1/2 mile track, it’s easy to see how that might be a difficult feat. While Scott and Junior never took home any major trophies, they remain important figures in the annals of sprint car racing because of the consistency of their solid performances in the points standings throughout the years. Perennial top-five finishers known for their formidable qualifying times, the Whitworth team proved to be a force to be reckoned with throughout their sprint car days. While the physical demands of sprint car racing led the two to leave the World of Outlaws series, their competitive fire continued to burn. 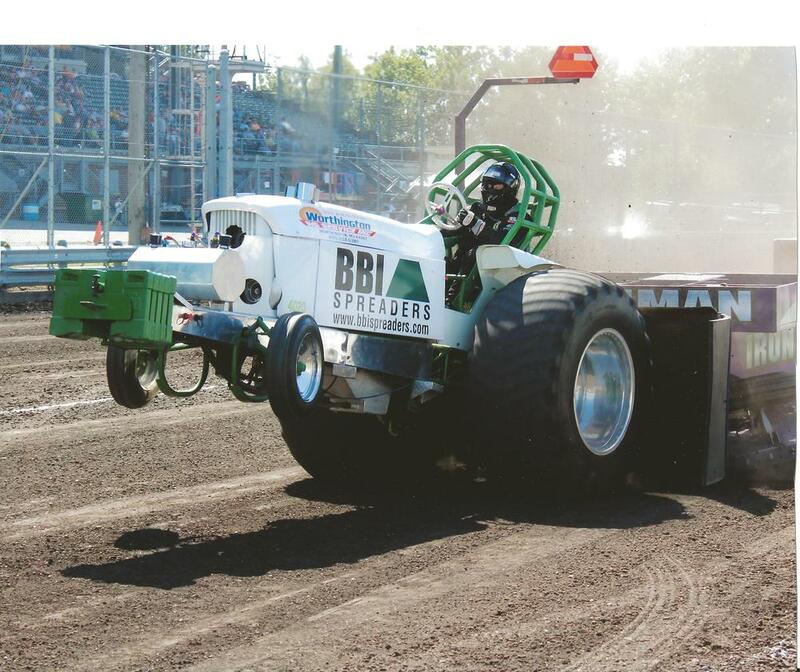 So the Whitworths joined another gang of Outlaws—this time the Outlaw Tractor Pulling circuit, where Scott is the driver of the BBI Spreaders tractor in the lightweight super-stock class. And what would a Whitworth farm be without a BBI spreader? With 1,200 cows and 10,000 hogs, the Whitworth’s generate enough manure to spread back onto their crop-land, making BBI’s Endurance spreader a key asset in their operations. “An Endurance will run every day on our farm so long as the weather’s fit,” elaborated Junior. With such an abundance of manure, Scott sells the dried material to others in the area. However, when customers ask how they’re supposed to spread the material, Scott doesn’t miss a beat, promoting Junior’s dealership, Worthington Ag Service, where his father stocks many of BBI’s spreaders for litter and manure, as well as fertilizer, lime, and many other applications to support the ag business in three-state area of Missouri, Iowa, and Kansas. In addition to stocking nearly the entire line of BBI’s spreaders, Junior also sells trucks and truck parts, as well as traditional ag inputs such as fertilizer, feed, and seed.